The German manufactured BIO-CEL submersible flat sheet membrane bio-reactor is an advanced design from MBR Technologies that has overcome the problems often associated with flat sheet membranes. BIO-CEL membranes have a unique and patented composite structure. During manufacture, the porous membrane sheets are bonded to both sides of a strong woven fibre central substrate using heat and pressure. Membrane panels are trimmed to size and the edges ultrasonically heat sealed. Finally, a centrally located permeate collection collar is adhered in place. The resulting product is a sealed membrane ‘pocket’, only 2 mm thick yet capable of withstanding considerable backwashing pressure, similar to that used with capillary or hollow fibre membranes. The clear advantage of BIO-CEL membranes is that an automatic pressure back flushing cycle using collected permeate can be incorporated to clear fouling deposits. Other brand flat sheet membranes are limited to a cleaning cycle where the membrane panel is filled with a cleaning solution at static pressure. This requires a residence time and the use of hazardous oxidizing chemicals. These are the only flat sheet membranes that can be backwashed under pressure. Membrane panels are joined together by the permeate collection spacers at 8 mm centres, creating a high density module yet maintaining a substantial gap between each panel to prevent clogging. Membrane surface area packing densities are similar to capillary type MBR systems. The simplicity of the BIO-CEL flat sheet membranes construction is a key to its’ renowned reliability. The centrally located permeate collection collars are simply stacked and self sealed creating a single internal permeate collection manifold. This overcomes the multiple tube and potential failure point problems common to other flat sheet membrane systems. During filtration, the semi-rigid membrane panels flex as aeration passes which prevents large particles becoming lodged. Membrane panels are suspended within the cartridge housing with a gap on all sides which prevents clogging. 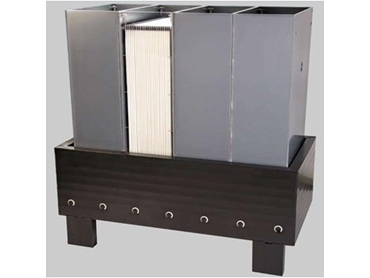 Plate and frame type flat sheet membrane panels are rigid and fixed to the outer frame and are susceptible to large particles clogging. The smooth flat sheet membrane panels do not trap hair or fibres so there is no braiding, a problem which plagues capillary and hollow fibre type MBR systems. The BIO-CEL aeration scouring system uses fine bubble aeration as compared to course bubbles used in other flat sheet type membranes. Considerable aeration energy savings are achieved. Microdyn’s new continuous MCP, Mechanical Cleaning Process, is a ground breaking development in the control of membrane fouling. The patented process uses specially weighted resin granules which are carried up in the aeration stream past the membrane plates. The granules brushing against the membrane surface have a continuous gentle scouring effect, removing organic and inorganic deposits. The result is a virtually maintenance free membrane with little or no chemical cleaning required and consistently high flux levels. The BIO-CEL MBR flat sheet membrane systems are ‘state-of-the-art’. Their advanced design technology combined with the inherent simplicity of construction provides a reliability and performance in comparison to other submersible MBR systems.